CNC units; extracts the best performance of Sodick's products as an excellent control tower. A CNC unit, or a computerized numerical control unit, controls the motion of a machine tool, a robot or the like based on numerical information and servo mechanism. 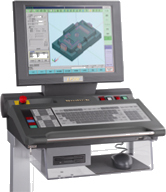 Sodick has self developed CNC units and the software for numerical control which are capable of controlling up to eight axes simultaneously. Sodick offers the possibility to fit additional axes as a factory option. Customers can choose from either Sodick’s own developed Rotary Table as an additional single A or B axis as multiple axes for indexing or simultaneous contouring. The factory option power supply LP34W (wire EDM) or LP10 (sinker EDM) is required for max simultaneous 8 axes control, which ensures the highest quality of performance. The capability is available for the following models. To meet the needs for machining more complicated shapes the WS-4P / WS-5P indexer are available as an option. This allows SODICK to target the medical, aerospace and high precision manufacturing.